Dental Veneers, also called all-ceramic ones, are currently the most advanced form of aesthetic teeth reconstruction. Veneers allow for obtaining beautiful and even teeth, and their shape is selected to the individual Patients’ expectations. Remember that we only put veneers on healthy teeth! Porcelain veneers are thin flakes made of porcelain, which we use to cover unsightly tooth surfaces. 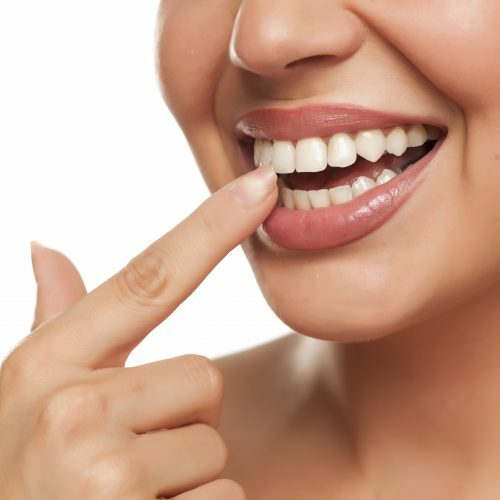 Veneers make it possible to cover extensive fillings, change the shape of a tooth (you can, for example, extend too short teeth) or remove the discoloration of enamel (eg. after antibiotic therapy). With their help, we can extend or extend the tooth or close the diastema (gap between the ones). What are the veneers different from crowns? First of all, the implementation of prosthetic crowns is much more invasive, because it requires removal of a lot of enamel. In the case of porcelain veneers, the teeth require only a delicate grinding and sometimes even a light dulling. Secondly – we use dental crowns on very damaged teeth, on which the veneer can not be made. Who are the veneers for? Veneers are a good solution for those people who are not completely satisfied with color of their teeth. When the yellow color of the enamel can not be lightened, for example, by the whitening procedure, then you can put on veneers that cover the color of teeth, thereby improving their aesthetics. In addition, veneers can be useful for those who do not like the shape of their teeth. We can then cover the natural enamel furrows or slight damage to the teeth (eg. cracks or chipped teeth), and even extend too short teeth. It is recommended to use porcelain crowns for very damaged teeth. definite change in tooth color. At the first visit in our dental office, after partial grinding of the tooth, a digital impression of the tooth / tooth is taken. During the second visit, the doctor glues the veneers with a permanent dental cement. Thanks to veneers, we eliminate the aesthetic imperfections of the teeth (color, shape, length, complementing the missing fragments). Teeth retain a natural-looking gloss and color, and are indistinguishable from natural teeth.